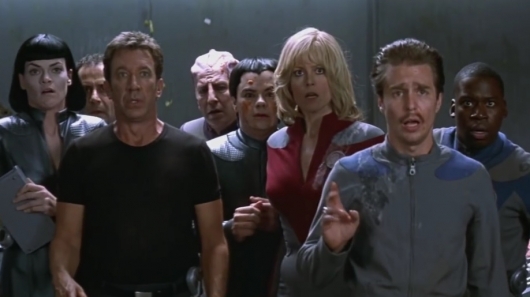 Back in April of 2015 we found out that a TV series based on the sci-fi comedy cult classic Galaxy Quest was being developed by Paramount Television. 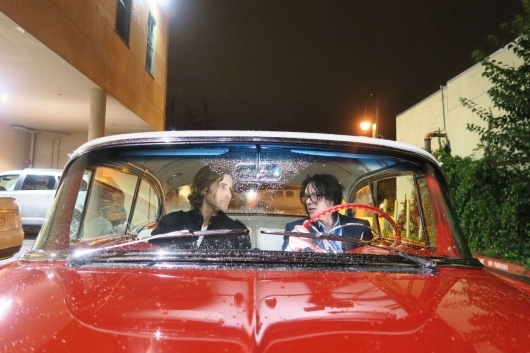 Then, later that same year came word that the project had been acquired by Amazon Studios. Now Paul Scheer (The League, Childrens Hospital), who was hired to write the adaptation earlier this year, has shared an update on where the Galaxy Quest TV series stands and what he’s hoping to go with it. Continue below to see what he had to say. Describing an episode of The League to friends who don’t watch it makes you seem like an immoral, depraved, sexually deviant, sports crazy psychopath. In others words, it’s freaking hilarious. For five seasons, the comedy about a group of friends obsessed with fantasy football has pushed the boundaries of decency way off the proverbial cliff. Last season, the show’s first on the new FXX network, continued to find new and ridiculous ways for our heroes to squeeze life into their fantasy football schedules. Let’s review where our characters left off in season five. ‘Escape to East Rutherford’ Super Bowl Trailer With Rob Riggle, Andy Samberg & more! During the NFL Super Bowl XLVIII Pregame show, a trailer was shown for the mock feature film called Escape To East Rutherford, starring SNL‘s Rob Riggle with guest appearances by Andy Samberg, Chuck Norris, Conan O’Brien, Joe Nameth, and Paul Scheer. The trailer for Escape To East Rutherford pokes fun at NYC’s traffic, cab drivers, weather, hipsters, attempted soda ban, and more. Check it out here below. A trailer for the new movie from Thomas Lennon and Robert Ben Garant, titled Hell Baby, has been released online. The duo are two of the creators of Reno 911! and The State, and are making their feature directorial debut here in addition to penning the screenplay. The movie is a horror-comedy about a couple who are expecting their first child when they move into their new home, a run down mess of a house in New Orleans…that also happens to be haunted. You can read a full synopsis and check out the trailer for Hell Baby below now. 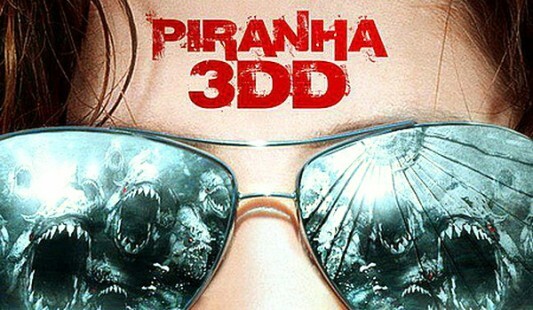 This weekend saw quite a bit of movies released, none of which seemed particularly interesting, but one did pique my interest: Piranha 3D, a reimagining of the 1978 Roger Corman feature Piranha. While the original film was an attempt to hitch a ride on the success of Jaws, this new film is instead riding the wave of the recent 3D phenomenon. Typically, when I find out a movie is in 3D, it actually makes me NOT want to go see it, as today’s 3D is more for high-definition picture quality, whereas I grew up in a time where 3D meant a harpoon was coming right at your face and that’s the 3D I want. Piranha 3D promised me this ‘gotcha’ 3D. As far as the film’s subject matter, I must admit I’ve been intrigued by those South America fish with a penchant for flesh ever since thrash metal giants Exodus sang about piranha on their 1985 debut album. Of course, I was probably compelled by the song’s reference to them as “Loki’s children,” trapped in the depths of Hell brought up to one day waste mankind. But I was introduced to these deadly creatures nevertheless and the fascination began. It helped a lot that Piranha 3D, directed by Alexandre Aja (The Hill Have Eyes remake), boasts a cast of Richard Dreyfess, Elisabeth Shue, and Christopher Lloyd, right there enough to get to me go see the film. 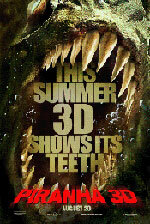 If you’ve seen Piranha 3D, then it’s time for some SPOILER TALK. Continue reading for my SPOILER-filled thoughts on the movie, and feel free to leave your thoughts in the Comments section below.